R.E.D. 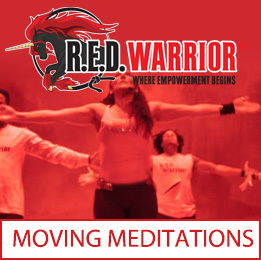 Warrior® Moving Meditations™ were created to allow you to improve or enhance an emotion. We go through life going through a myriad of emotions. Some that serve us well and others that distract us from achieving happiness. Our Moving Meditations™ use music and movement in short bursts to realign or amplify your energy. These are meant to be used as everyday tools.